Larry Hope serves with I-58 Navs in uptown Chicago. 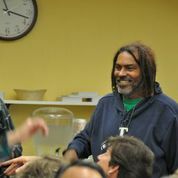 After wrestling with the Lord where and how best to serve, Larry resolved: “After lots of prayer I'm staying in Uptown. Even though it's lonely, it is fertile ground for the Gospel.” That confirms the where, but how best to serve? Larry explains his “enough is enough” conviction. I struggle daily as I minister in an under-resourced community. I reach out to men who routinely wake up in shelters or parks, start the day getting high on who knows what, then look for something to eat. Can you imagine living that way 365 days a year? The parable of the lost son is an apt illustration (Luke 15:16–20). Here’s “the modern uptown version.” There once was a man who was tired of living what he called a boring life. He wanted to do what he wanted when and how he wanted, so he decided to ask for his inheritance early. He left home, met some new friends who introduced him to a fast-paced life of drugs, then drugs took over and his new friends were gone. This man who had everything saw his life erode away into the shame of yesterday and began living in shelters, eating in everything from dumpsters to soup kitchens just to stay alive. I’m convinced that until a man comes to that point he will continue to sleep in shelters and eat in soup kitchens. Love for God has slipped away. Joy has taken a vacation. Peace is at war within him. Patience, kindness, goodness, and faithfulness are close to throwing in the towel. Self-control has left the building. Until he has a moment of clarity like the prodigal son, I must be like the father, waiting on him and praying for his return to God.